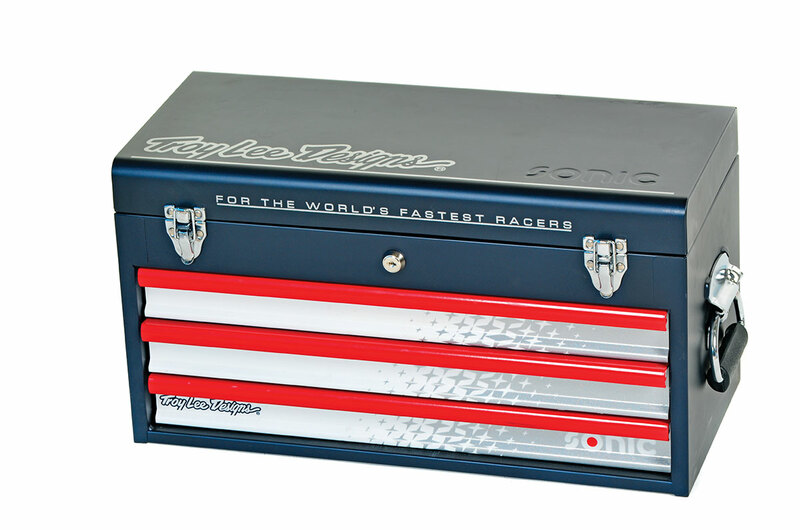 PRODUCT: Sonic Tools and Troy Lee Designs collaborated on the Moto toolbox solution sporting a custom-painted design and a limited number signed by the artist Troy Lee himself. The toolbox comes filled with an 88-piece tool set designed specifically for working on dirt bikes during a day at the track. The chest itself features an alloy construction throughout with a three-drawer pull-out design and a top that opens for additional tool storage. Internally, the top and each drawer is equipped with chemical-resistant and laser-cut-foam inlays that separate and clearly label each tool. POSITIVES: The alloy construction of the three-drawer tool chest stood up to tons of abuse. You can tell lots of time and effort went into choosing the correct tools to include in the 88-piece set, and it was done by people familiar with working on dirt bikes. This doesn’t happen very often. All the Sonic tools come with a lifetime replacement warranty that is easy and hassle-free. In most cases, just a picture of the tool will suffice and there is no need to send the actual tool in. Having the foam mats not only organize the tools so you know if something is missing, but it keeps the tools from banging around inside getting damaged and making noise. It’s also easy to have someone grab tools out of the box with each one labeled. NEGATIVES: There are some items we would have liked to see included in the kit, like a rubber mallet (instead of the machinist hammer) and a set of tire irons. We realize most people get a flat and stop riding for the day, but that’s just not us. The top of the chest needs a strut or something designed to keep it open when in use. We got our fingers closed on a couple of times before we wedged something in place. BOTTOM LINE: The entire staff thinks the Sonic Tools/Troy Lee Designs did a great job on this collaboration, and we hope this is just the beginning of kits designed specifically for working on dirt bikes. Not only is the kit practical for our application, but it’s under 50 pounds, so transporting is easy and it looks cooler than any other toolbox we have seen. Another thing we really liked about this toolbox is it makes a great gift for anyone who has a dirt or dual-sport machine, and it’s something that even a person without any tool knowledge can purchase with confidence.